One of the most valuable aspects of running an independent webstore is your ability to build an email list. This is proprietary data no one else on the web has but you. It is your leg up on the competition. It is your vehicle for building value and engaged relationships with your customers. It is a key mechanism for how you increase customer lifetime value and successfully predict the trajectory of your business. The strategies you employ with your email list are important, in the same way how you talk to and interact with your customers on social media, on calls or in forums is important. You are building a relationship. You are sharing information. You are providing opportunities and touch points beyond what someone not on that email list would get. After all, they have already purchased with your brand. Industry benchmarks show that nearly 21% of people will open your email, with 2.56% of them clicking through to your website. Additionally, 33% of recipients will open your email on subject line alone and 55% of emails are opened on a mobile device. Of course, your brand doesn’t have to settle for benchmark standards. You should strive to beat them — and the following email marketing best practices will help you do just that. There are at least 11 different email campaigns and triggers retailers should use to keep customer engagement high. These 11 campaigns fall under four buckets of communication. Want to see how many lost sales you could recover? Do the math with our Abandoned Cart Calculator. Abandoned cart emails are used on new and repeat customers who have logged in to your site, added items to their basket and then left. Abandoned cart emails can recover 15% of what would have otherwise been lost revenue. In some case, implementing an abandoned cart email has increased online business revenue by 50% and recovered hundreds of thousands in sales. “In our first eight months, we recovered more than $425,000 in sales using abandoned cart emails,” said Ken Harrison, CEO of Enjuku Racing. According to recent research from Bluecore, cart abandonment emails have the highest average conversion rate (2.63%) and click-to-conversion rate (21.78%) of any triggered ecommerce email. Abandoned Cart Email: Encourage customers to complete their purchase if they leave items in their cart. This is an email that reminds customers of the items they left behind. This usually sends within 1 day of the abandoned cart. Abandoned Cart Series: Encourage customers to complete their purchase with a series of reminders if they leave items in their cart. This is an extension of the first abandoned cart email. Many retailers send follow-ups 3-5 days after an abandoned cart and typically offer a discounted rate for the product(s). Be conversational in your email. Use psychological triggers to encourage conversion. Scarcity and social proof are often used at this stage. Up-sell and cross-sell emails are sent to customers who purchased an item. The goal is to sell them additional products and increase your store’s AOV. According to the BlueCore study, these types of emails typically have a .55% conversion rate, with a 6.84% click-to-conversion rate. Percentage click-to-conversion rate for post-purchase emails like up-sell and cross-sell campaigns. Any Product Follow-Up: Send a follow-up message after a customer purchases any product from your store. These emails usually include similar products or products often bought with the item the customer purchased. Think of these are similar to Amazon’s “Frequently Bought Together” section on product pages. Category Follow-Up: Promote related items after someone buys from a specific category. These emails are typically used if a customer bought an item from a campaign. For instance, if someone bought an item from a collection of “Gifts for Dad,” you have a similar collection for “Gifts for Mom,” send them a follow-up and show them their options. Receipt Follow-Up: Receipts from purchases have one of the highest open rates on the web. More than 70% of customers will open these emails. Use your receipt, then, to do some legwork for you. Include offers and discounts for recommending friends. Ask for a review on the product when they get it. Be sure they have access to your returns and exchanges policy, in the case they need to have it on hand. Installing a one-click app like Receiptful can automate this process for you. This app offers receipt templates and analytics to help you make the most of these high-visibility emails. Promotional emails can be used in multiple ways for a variety of customers. You may have a site-wide discount to tell your customers about. Maybe you launched a new product line and you want to give your email list first-access to the goods, or maybe you’re offering special incentives during the holiday season. Conversion rates for the various email types in this category vary. Price decrease is the most successful, with a 1.04% conversion rate and a 9.68% click-to-conversion rate. Low inventory falls in second place, triggering the psychological impulse of scarcity, with .55% conversion rate and a 7.37% click-to-conversion rate. New merchandise emails have a good click-to-conversion rate (8.23%) but a lower conversion rate (.39%). Conversion rate of price decrease emails. Price decrease emails have the highest conversion rate and click-to-conversion (9.68%) rate of all promotional emails. High AOV Customers: Use promotional bundles, monthly subscription boxes and product recommendations that align with the typical buying cycle of this segment to help these customers find and buy all the items they need at once. Discount Customers: These are customers who typically buy with your brand only when an item is on sale. Send them updates on sale opportunities and additional ways to save money (i.e. loyalty programs, refer-a-friend, etc.). Face Value Customers: These are customers who often buy at face value. They aren’t driven by discounts. Many of them are likely driven instead by the newness or exclusivity of a product. Send these customers first-access promotions to new products or lines. Use customer groups to personalize the on-site experience for your segments. 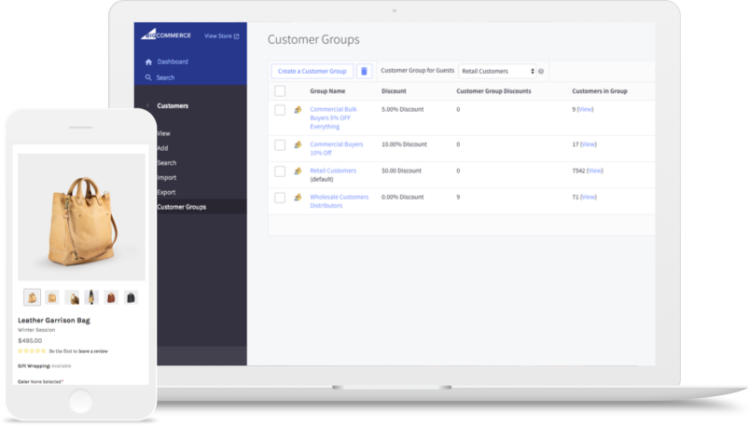 Customer groups allow you to alter products and prices for specific groups so that you show discount customers the discount prices, which Face Value Customers get to see new product lines before anyone else. Customer loyalty and re-engagement emails focus on building a relationship between you and the customer. While all emails should have an element of a reciprocal exchange, these emails focus on building a stronger bond with a customer and winning back customers who haven’t purchased from your store in a specific timeframe. Life Event Emails: Depending on your category, you can collect additional information from customers that will help you to drive more significant relationships in the future. For instance, birthday emails often include a discount during the month of a customer’s birthday –– wishing them well and giving them a personalized reason to shop. Win Back Emails: You’ve seen these emails in your inbox before. These are the “We’ve missed you” headlines that come through after you haven’t shopped with a particular brand in a while. They typically include a conversational message, the opportunity to opt-out of communication as well as a discount code in the case the customer wants to re-engage. Replenishment Emails: If you sell something that has a defined period of usage –– anything from water filters to light bulbs –– you can send an email at repurchase time to drive re-orders. Ecommerce email marketing is both a science and an art. You can review your metrics and find areas to A/B test, but every test will likely call upon good copywriting and psychological triggers in order to increase performance. There is no one method that works for every brand. So, we sought out experts across the industry to provide their #1 piece of advice for brands looking to improve the performance of their email marketing efforts. We sought out experts across the industry to provide their #1 piece of advice for brands looking to improve the performance of their email marketing efforts. Many of these experts come from the analytics field, and have vast experience digging into the data to uncover trends. Others come from the email marketing field itself, and work with brands large and small on a daily basis to help them optimize performance. The rest of marketing growth hackers. People who have figured out how to use email to nurture customers into repeat customers, and repeat customers into engaged, word-of-mouth promoters. It will take tidbits from each perspective to holistically optimize your email campaigns, but rest assured, each piece of advice can drastically improve your email marketing conversion rates. Don’t be boring. Most brands could benefit from adopting a much more friendly approach to email. Instead of sending out a boring email that says “your package has shipped,” take that time to add a funny GIF of some penguins dancing with joy that your package has shipped. Make the text lighthearted by putting yourself in your customer’s shoes. Now when you ask for that up-sell by including a few recommended products, it’s much more likely to be received positively. Nail your abandoned cart emails. Also, focus on emails that get a recent buyer to purchase a profitable add-on to something they just bought. The margin for add-ons are usually much better than the product itself. Also, offer a compelling incentive for them to do this. Think triggered email sequences. You need the Big Two: an email welcome series and an email abandoned cart series. Expect both to clock in at twice your average site wide conversion rate. Many newsletters are too sales-oriented, which is a weird experience for the user who most of the time will read that content while not in a purchasing mindset. Instead, I would focus on building a long-term relationship with the user and optimize the content for high open and sharing rates rather than just the CTR. The newsletter from TheHustle.co is a great example of that strategy. You should be sending out different messaging and discount offers to your site visitors depending on the actions they have taken on your site. First time visitors, repeat visitors with no orders/one order/multiple orders/ cart abandoners, etc. Also, if you have access to historical data, look for the days of the week where transaction volume peaks. Time your emails to follow this pattern. Have a clear call to action. The average user received 84 emails per day in their inbox, according to Radicati’s report. Your email is most likely just another one of them. Despite your best effort to send beautifully designed emails with relevant content, your customers are bombarded with a lot more emails, hence why your call to action is so important. Number of seconds you have to get a person to notice your CTA in an email. You have around 3 seconds to get a person to notice your call to action. Have one action, above the fold, that’s instantly readable on any screen. We see way too many examples of stores trying to demonstrate how amazing they are instead of thinking about the person actually making the purchase. Talking about CTAs, a big no-no is having many calls to action in the same email. Knowing that you’re fighting for your customers’ attention, you want to be clear from the get go. An effective way to be clear from the get go is to use your subject line as a call to action preview that incentivizes the reader to open the email and get value out of it. Create a welcome email for new subscribers –– or even a welcome series –– for every opt-in form you have on your site. The best time to send someone an email is immediately after they sign up to hear from you, and this is a great time to share your best content and offers. If you’re using Google Analytics, come up with a campaign tagging framework to be able to track which links in your emails have the strongest draw. In the end, it’s simple math. The more you segment your list, and the more customized each email is to that segment, the higher your conversion rate. It’s as simple as that. Avoid sending “batch and blast” newsletters and try to segment your audience using information you know about them, for instance their interests or their purchase history. Sending relevant and targeted emails will help you to maintain long term subscriber engagement. People are most engaged with a brand the in first 60 days after which there can be a huge drop off if you don’t keep them wanting more. Keeping your customers opening, clicking and, of course, purchasing means making sure you’re sending them something they’re interested in. If you don’t, many, rather than unsubscribing, will simply stop opening your emails, and you’ll have an inactive customer base. Keeping your customers reacting to your emails not only has benefits in terms of generating revenue from emails, but helps to keep your email reputation intact. If you repeatedly send to inactive subscribers, you could start going to junk. And not just for that subscriber, but for everyone on the same email domain. Segment as much as possible. We recently sent out two similar campaigns for our new Holiday Ecommerce Report –– a typical email blast and a segmented mailing focused on retail businesses. The email blast saw around 11% open rate while the segmented mailing over 40% open rate. All it takes is a bit of focused copy and a segmented list of email subscribers. Email is great for discounts and promotions. Keep a list of all past customers and use it to promote sales and specials with a deadline. This will create urgency and keep people coming back for more. Every email is an opportunity! Even in an order confirmation, you can include a coupon or incentive for them to re-visit your site, signaling to them you won’t be sending emails without value. Adding an offer like “Leave a review to get 20% off your next visit!” is a great method to incentivize reviews while also boosting the chance of bringing customers back to your site. Percent of customers who end up buying after clicking on promoted products in a review request emails. Yotpo data shows that when stores added discount incentives to post-purchase review request emails, the conversion rate of customer to reviewer jumps from the industry average of 2% to an impressive 26.83%. Compound this strategy by upselling when asking for reviews. Yotpo data shows 27.5% of customers who click on promoted products in review request emails will end up buying. My top tip is that every email needs to have more than just a point –– it needs to include a strong call to action that exchanges a valuable reward to the customer for interacting. Leverage this incentive-offering email marketing strategy to collect customer reviews and upsell. People like to get something back. So give a little and get a lot more in return. Target your emails specifically to each of your unique buyer personas to make each buyer persona feel understood and welcome by your brand. Avoid general email blasts that make subscribers feel like they’re on the wrong list communicating with the wrong brand. Don’t be generic. An email with a grid of products is generic, and probably won’t inspire users to take action. Be specific. Feature specific products and why they are of benefit to your list. Tell them how they will look, how they will feel when buying. Use cart abandonment emails. People who abandon their cart are near the end of the conversion process and are thus most likely to convert when you send them a followup email. Percent of users who abandon their carts before completing their purchase. Did you know that nearly 70% of users abandon their cart before completing the sale? Crazy, isn’t it? This is surely a number that you will want to reduce. You should be sending multiple cart abandonment emails. Set emails for 1 hour, 24 hours and 7 days after someone abandons their cart to get them to come back. Include images of the products they have in their cart, offer a discount and include a strong call to action to get them to resume their purchase. Don’t wait until checkout to get the email address. Offer valuable content for those early and mid-buying stage visitors so you can nurture them toward a first purchase. For example, “The Ultimate Guide to Colorado Rivers” might be a good piece of gated content on an outdoor website that could be offered to visitors in Colorado who are in the Rafting section. The more targeted the better! Learn about the spam filters and how to stay out of them. Millions of dollars in marketing are going to waste because emails are never seen. That’s a new problem as open rates decrease. Automate what you can. Come up with personalized email campaigns based on certain customer actions and data you have. For example, follow up customers who abandoned their carts, or stopped browsing your products. Send them personalized offers based on what they bought in your store. Don’t forget about email marketing. From social to video and inbound there are no doubt many new and effective digital channels to reach your audience. That being said, some of the old standards are still valid –– including email. With a high quality email list gathered through customers or content subscribers, your email campaigns should be one of your highest converting. Want more tips for boosting sales using email marketing and other proven strategies? Check out our post on the 13 quickest ways to increase ecommerce sales.